Yes its not the brightest torch on the market at 320 lumen, but it is a true lumen count, unlike a lot of the cheap chinese specials, but it is a solid build and semi decent throw at 260m. Comes with new set of batteries for both torches and holsters. Plenty of stock it seems as well. Yes you can get cheaper torches with higher lumen output and throw, but those are generally use 18650 batteries. This uses good old AAA batteries that you can buy anywhere. £25 for a torch?? I’d rather blast out 25 from the poundshop!!! Some of these reviews are two years old? good price for 2 good torches. Your choice, but how are you going to find where torch number two is, when torch number one, out of twenty five, packs up? Some might choose a torch that is unlikely to fail at inopportune moments. That said I have a Ledlenser P14.2, which appears pretty much the same spec as this one, and I don't really like it much, but I don't really know why. It's extremely good quality and feels like it will never fail. The zoom is great, and it lights up the place really well but I don't choose to use it if I don't have to. Maybe it's the shape, or maybe it's because it's just a very functional torch that just works, so is a bit boring? Who knows? Your choice, but how are you going to find where torch number two is, when …Your choice, but how are you going to find where torch number two is, when torch number one, out of twenty five, packs up? Some might choose a torch that is unlikely to fail at inopportune moments. That said I have a Ledlenser P14.2, which appears pretty much the same spec as this one, and I don't really like it much, but I don't really know why. It's extremely good quality and feels like it will never fail. The zoom is great, and it lights up the place really well but I don't choose to use it if I don't have to. Maybe it's the shape, or maybe it's because it's just a very functional torch that just works, so is a bit boring? Who knows? Poundland torch+batteries - "the bloody thing was working earlier - anyone got a lighter?" Poundland torch+batteries - "the bloody thing was working earlier - anyone …Poundland torch+batteries - "the bloody thing was working earlier - anyone got a lighter?" Well done, can you tell everyone how to travel back in time to purchase at that price? I paid £50+ for a few torches. You get what you pay for. I own a number of different flash lights enough for a small collection, if you do not mind a wait then I'd recommend the Convoy S2+ which can output 960 LM. Mine took about 3 weeks to arrive but it is such a nice flash light. They're unregulated as far as I recall. ie the output drops significantly as the battery is used. So you'll get 320 lumens for a few seconds on a fresh battery. A modern regulated flashlight keeps a relatively constant output throughout the majority of the battery and only drops off when the battery is nearly empty. Lensers have good optics but in every other respect they are years behind in flashlight technology. I recommend the silver Convoy C8 which can be had for around £13 with the right coupon. With the difference you could easily buy an 18650 cell and basic charger. If you got this budget to spend on a flashlight Get a proper chinese one such as BLF A6 ( REAL 1600 lumens) about $20 + need your own 18650 cell+charger. It's AS bright/brighter as good car headlights with a very good spread. Or something from Convoy range. Both has excellent quality way above this one.. Being able to run on AAA batteries isn't really that much of a benefit as you can just as easily get much cheaper ones with similar output that also run on AAA batteries. Or for £25 you could easily get a much more powerful torch, a decent 18650 battery and charger. Sorry but this is just overpriced overmarked junk,you can get about the …Sorry but this is just overpriced overmarked junk,you can get about the same light output out of the better 1pound lights at homebargains/poundshops... If you got this budget to spend on a flashlight Get a proper chinese one such as BLF A6 ( REAL 1600 lumens) about $20 + need your own 18650 cell+charger.It's AS bright/brighter as good car headlights with a very good spread.Or something from Convoy range.Both has excellent quality way above this one.. But it's not just about light output, it's also about build quality. Sure you can get a bright cree torch for a couple of quid from Ebay but you often get the square shape of the chip standing out in the middle of the light, or you find that that the click pusher different feel responsive, or that the finish of the torch doesn't feel good in the hands, etc. 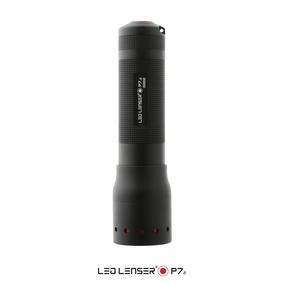 I've got both a Convoy S2 and this Led Lenser P7.2 and I like them both equally. The Convoy is a bit brighter and has a nice light but the Led Lenser has a great build quality and somehow feels a bit nicer to use and hold, and the anti roll collar is good. For people that just want to go to the shops and pick up a nice torch that should last for a long time this is a good deal. Yes, like i said not the brightest. Guessing you dont own the A6 then, yes 1600lm but only with the right battery, which most wont know about. Stick a protected cell in that and you wont get 1600lm. Also if you use the torch every day and battery goes flat, what shop do you pop into to buy more batteries. 18650 torches are great if you invest high quality batteries (4 at least) and a decent charger, which will cost roughly £40. Most people just want a torch that is solidly built and last. Good luck getting same lm count from the 9 led torches they sell in pounland. LED Lensers are top notch quality, small, lightweight and simply excellent. I used to use a 3 cell Maglight that used to work no matter what, but it was bloody heavy and bulky. These Lensers are wonderful and I just wish I had access to them years ago. I don't need them like I did now, but have several anyway. I'm sure like cars, there is always better on the market, but I think they are great. This is a quality set the packaging is fantastic and the perfect gift for someone who is a bit gadgety.. I absolutely love my kit I got from blacks, absolute bargain, love it!!.. Maybe I'm missing something, but the link takes me to the "LED Lenser P7.2 Professional LED Torch Gift Box" There's no mention of it being the Combo pack with a free P3 ? Maybe I'm missing something, but the link takes me to the "LED Lenser P7.2 …Maybe I'm missing something, but the link takes me to the "LED Lenser P7.2 Professional LED Torch Gift Box" There's no mention of it being the Combo pack with a free P3 ? What is the battery life like on the current P7.2? A few years ago it used to be absolutely terrible and only lasted four hours on the 200-250 lumens setting. Has it improved your tactics? You'll cry when you lose your trillion lumen silly price torches tho' . Yes, like i said not the brightest. Guessing you dont own the A6 then, yes …Yes, like i said not the brightest. Guessing you dont own the A6 then, yes 1600lm but only with the right battery, which most wont know about. Stick a protected cell in that and you wont get 1600lm. Also if you use the torch every day and battery goes flat, what shop do you pop into to buy more batteries.18650 torches are great if you invest high quality batteries (4 at least) and a decent charger, which will cost roughly £40. Most people just want a torch that is solidly built and last.Good luck getting same lm count from the 9 led torches they sell in pounland. I actually got A6 and run it with the correct high-drain samsung 30q , IT'S AWESOME! On the 1600lumen mode the 3000mah battery lasts 20mins.. lol.. Totally worth it however.. Stick it on lower mode and it will run for hours.. I actually got A6 and run it with the correct high-drain samsung 30q , …I actually got A6 and run it with the correct high-drain samsung 30q , IT'S AWESOME! On the 1600lumen mode the 3000mah battery lasts 20mins.. lol.. Totally worth it however.. Stick it on lower mode and it will run for hours..
Fair enough, but build quality is poor on this. Bad soldering on the driver chip, extremely hot on full turbo run, not getting full 1600 due to spring on driver and switch side, need to add higher gauge cable to achieve full draw. Got one or two torches and mod myself. Fair enough, but build quality is poor on this. Bad soldering on the …Fair enough, but build quality is poor on this. Bad soldering on the driver chip, extremely hot on full turbo run, not getting full 1600 due to spring on driver and switch side, need to add higher gauge cable to achieve full draw.Got one or two torches and mod myself. I think amazon has this at same price and with newer reviews.